Stacks of 3 identical fruit symbols add 1 Bonus Game to the respective Fruit Pot. 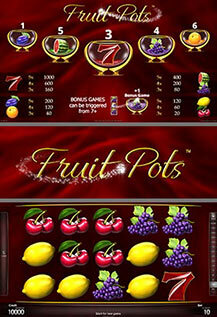 With a Bonus Game Counter of 7 or higher, the respective pot will be randomly triggered for the FRUIT POT BONUS FEATURE: The feature is played with an alternate reel strip featuring X symbols and the respective fruit only. All appearing fruit is collected and eventually multiplied with the respective fruit multiplier (5x-15x) at the end of the feature. Bonus games cannot be won again during the feature.